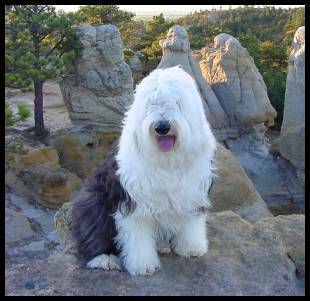 Search and adopt a Old English Sheepdog near you. Agile, strong, square, compact, balanced dog. The Old English Sheepdog is a large dog. They are playful, intelligent, adaptable, loving and sociable. Recognizable by its long, thick, shaggy grey and white coat, with fur covering their face and eyes. Historically, the breed's tail was commonly docked but tailed Old English sheepdogs are now common, as many countries have outlawed cosmetic docking. The double coat may be any shade of grey, grizzle, black, blue, or blue merle, with white markings. The undercoat is water resistant. Puppies are born with a black and white coat, and it is only after the puppy coat has been shed that the more common grey or silver shaggy hair appears their lifespan is 10 – 11 years. The Old English Sheepdog comes from the very old pastoral type dogs of England, Most experts agree that the Bearded Collie was among the original stock used in developing today's breed. The Old English Sheepdog was at first called the "Shepherd's Dog" and was exhibited for the first time at a show in Birmingham, England, in 1873. The breed was exported to the United States in the 1880s. The breed standards describe the ideal Old English Sheepdog as never being nervous or aggressive. This breed's temperament can be described as intelligent, social and adaptable. The American Kennel Club adds that the breed has "a clownish energy" and "may try to herd people or other objects. With wide open spaces being the ideal setting for an Old English Sheepdog, the breed is a natural fit in a rural setting, such as working on a farm; although, with proper exercise and training, they are perfectly comfortable with a suburban or urban lifestyle. Old English Sheepdogs love the company and the warmth of people.